Sweet Sweat opens the sweat glands, promotes perspiration, and moisturizes the skin. But does it aid in weight loss? Probably not. Read this review on its effectiveness. 7. Who Can Use the Gel? With over 7,000 reviews and a 4.5/5 rating, Sweet Sweat seems to be dominating the market. Offering both waist trimmers and workout gels, Sports Research promises to aid in weight loss as well as tone the muscle. One might argue that a 4.5/ 5 rating doesn’t just happen, and it’s hard to deny that many people are satisfied with the results. But the question remains, does Sweet Sweat work? Or are these reviews ‘manufactured’? Read on to learn what I found out. A workout-enhancing gel that opens up sweat glands. 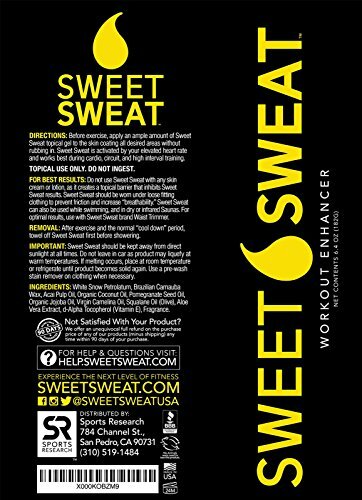 Sweet Sweat is a brand owned by Sports Research, and it offers a workout enhancing gel. The product’s primary goal is to aid in weight reduction through thermogenic activity and sweat as well as improve blood circulation. The workout tools are designed to offer better warm-up, recovery, performance and prevent injuries. Sports Research, established in 1980, is behind Sweet Sweat among other products. This family-run Company has dedicated to providing high-quality products and supplements for professional athletes and gymnasts alike. The first gel was launched in 1987, and 31 years later the brand seems to be dominating the market. According to the manufacturer, this gel targets low-to-respond problems and helps accelerate warm-up-time. Plus, it fights muscle fatigue and strains. You can choose either original, unscented, and coconut formulas. They are neoprene constructed to help increase core temperature during exercises by improving thermogenic activity. These trimmers work best if used in combination with Sweet Sweat gel. SR also offers various supplements from collagen peptides to Garcinia Cambogia to improve health and prevent chronic diseases. White Snow Petrolatum is the main ingredient for the gel. Petrolatum or vaseline or petroleum jelly is a semisolid mixture obtained from refined crude oil. Petroleum jelly is a skin barrier, moisturizer, and protectant and usually penetrates the superficial layer of skin. White petrolatum is usually used to protect the skin against irritants and wetness, probably the reason why its used in Sweet Sweat (1). Although organic coconut oil contains saturated fat, it can improve your overall health in various ways. And, it enhances skin appearance, nail, and hair. Additionally, it moisturizes and promotes skin elasticity (2). Pomegranate seed oil stimulates major cells to revive the skin and reverse the damage. Additionally, it helps to fight free radicals and protects against skin damage. Plus, it is perfect for all skin types (3). Jojoba oil is a humectant ingredient– it seals the skin and keeps from losing moisture thus preventing bacterial infection. Furthermore, it contains antimicrobial properties and prevents E.Coli infections (4). Camelina oil contains vitamin E and Omega-3 fatty acids which protect the skin from damage. Olive oil contains many vitamins like A, D, E, and K and is also rich in antioxidants which prevent or reverse ultra radiation. Besides treating conditions like Eczema and psoriasis, Aloe Vera can treat sunburns, moisturize the skin, and lessen stretch mark visibility. This fat-soluble vitamin is a nutrient and an antioxidant. It is not only known for protecting the body from free radicals but also from sun exposure (5). Not sure about the location, but the manufacturing company is based in California, United States. 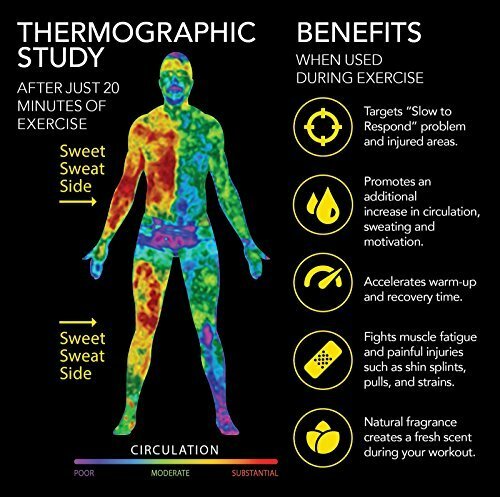 According to Sports Research, Sweet Sweat works by creating a thermogenic effect on the applied body parts. Furthermore, it increases circulation to the body muscles allowing you to workout for longer. And, it accelerates your recovery time thus reducing aches and cramps (6). Athletes are the primary target audience, but anyone seeking to enhance their exercises can use the products. The primary goal of the workout enhancing gel is to improve circulation, enhance circulation, and quick recovery– all beneficial to an athlete or bodybuilder. Moisturizes the skin and leaves your skin smelling fresh. Before a workout, apply ample amount on the desired areas without rubbing into the skin. The topical gel can be used under workout clothing. Plus, you can use it in an infrared or dry sauna. When removing the gel, use a towel to wipe excess sweat and shower using warm water. Sweet Sweat gel can be used on it own, but for maximum results, you are advised to combine it with the SR waist trimmer or belt. The primary goal of Sweet Sweat is to promote thermogenic activity and sweat. 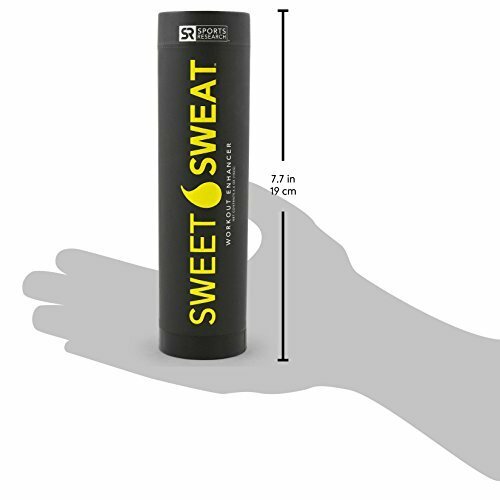 According to SR, Sweet Sweat gel promotes heat production which enhances calorie burn. Its true, heat production or thermogenesis does promote calorie burn, but the results are not that significant. Secondly, SR claims their product enhances sweat which can in turn help with weight loss. No research exists that support the relationship between sweat and weight loss. When exercising you sweat a lot, but that is the body’s natural way of regulating temperature. What you lose is not fat, but water weight, which you regain once you rehydrate (7). The idea of promoting weight loss in a targeted body area is a fallacy. Your body loses weight all-around not in one specific area. But, you can do targeted toning. Side effects are relatively low as the topical gel uses natural ingredients. But, some users have reported skin irritation and allergic reaction due to various oil and waxes. Additionally, White Snow Petrolatum can cause irritation, burning sensation, and redness in some people, though it’s rare. “ I love this gel. I don’t ever sweat, and if I do, it’s very little. However, when I use the gel and wear a waist trimmer under clothes, I have noticed I sweat so much. I have seen a lot of progress. “I have struggled with the mom ‘pooch’ years. But, when I started using this gel, I have noticed a difference. I don’t know if it’s just water weight, but I will continue to use it to find out. This cream contains an essential oil blend that targets sweat glands to increase perspiration. Plus, it improves circulation. It contains 8% organic ingredients that soothe and reduce tight muscles. Furthermore, it reduces the appearance of cellulite. This cream is enriched with ginger lily that stimulates circulation. It also contains Aloe sand Meadowfoam seed oil that leaves the skin soft and smooth. Plus, it has fruits like tangerine and grapefruit that brighten skin and promote collagen and skin elasticity. The gel opens skin pores and improves circulation as well as increase perspiration. I appreciate that Sweet Sweat contains natural ingredients that will protect and moisturize your skin. However, the lack of research on the effectiveness of the gel is a bit concerning, and I would not recommend the use of the supplements. Thermogenesis does help the body not only produce heat but can aid in short-term weight loss. Exercise. Cardio workouts like cycling or running can help with fat reduction. Additionally, the exercises can also enhance loss of abdominal fat. HITT or High-Intensity Interval Training is more effective at burning fat faster (8,9). Sweet Sweat can be bought from official website or Amazon.